Holiday Hop for Pets giveaway: Win a hand-knit Christmas stocking, with your dog’s name on it! Well, to be frank, that’s what it will look like. Mine is done down to the heel, but I promise you I’ll be finishing it over the Thanksgiving break. Isn’t it adorable?? I just love the bands of white snowflakes, red bones and green dogs. And you see that blank cream-colored band at the top? The winner will tell me their dog’s name (it can be up to 15 letters long), and I’ll stitch it in, so the stocking is personalized for your pup! It’s easy! All you have to do to earn a chance to win is “like” Dog Jaunt on Facebook (click above), if you haven’t already, and then leave a wall post on Dog Jaunt’s Facebook page (click on the “Post” button, at the top of Dog Jaunt’s Facebook page) telling me the dog’s name you will want on the stocking if you win. If you already like Dog Jaunt’s Facebook page, you can still win! Just go straight to the step where you leave a wall post with your dog’s name. Because of shipping costs, I can only send the stocking to U.S. and Canadian (not Quebec) winners (why not Quebec? That province apparently has some stringent giveaway rules, and I don’t want to get into trouble!). Entries will be accepted until Thursday, November 25, 2010 at 11.59 pm (EST). The winner will be chosen randomly, and I will announce who it is in a post here on Dog Jaunt and on Dog Jaunt’s Facebook page on Friday, November 26th. Happy Howl-idays to all you hop-pers! 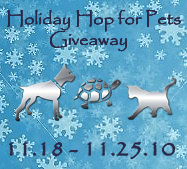 (Or maybe that should be “Hoppy Howl-idays!”) Be sure to click around the other sites participating in this blog hop — there are lots of wonderful prizes out there. What a beautiful stocking! How fun to have one for our puppy. We entered over at your facebook page! (Jenn Waters)! clicking over to follow and enter! Only have Kitties as you know, but just wanted to say that’s a really cute stocking! That is *such* a great gift and made with your very own two hands!! You know how much I am into handcrafted stuff. I wish that I could knit, but the best I can do is crochet baby blankets. Love the stocking. We got a pup in April, and I haven’t gotten a stocking for her yet. Thanks for participating in the holiday hop! This is FANTASTIC….our cool if our Boxer had his own stocking this year! It is lovely…. Thank you so much for all these wonderful comments! Make sure you’ve “liked” Dog Jaunt’s Facebook page and left me a wall post telling me your dog’s name — that’s what gets you the chance to win (and I love seeing you there too). A special thank-you to Karen, who can make anything. What a relief to learn that you can’t knit! If we end up at a BlogPaws or similar together, I’ll teach you… (True confession: I can barely crochet, just enough for the edges of some knitted things.) Everyone take a look at Karen’s entry in the Holiday Hop for Pets giveaway, under Doggie Stylish — her work is really wonderful! Okay, Dog Jaunt has been duly Liked on Facebook. Not only would Dinah love a beautiful handknit Christmas stocking, but her mom would love to know what pattern you used! This is a bummer…I do not do the facebook thing, sorry. Would have loved to enter. Great hop giveaway prize! Soooooooooooooooo I guess I just stopped by to say Happy T-Day……. I’m so sorry, katklaw777! Next time I’ll think about adding another way to enter, for the folks who aren’t so addicted to Facebook. Hello, blogdog! The pattern is from Judith Swartz’s Dogs in Knits book. Look out — I think her directions place the markers for the toe decrease in the wrong locations. I ended up using another Christmas stocking pattern’s directions instead for the toe, modified to work with the stitch count for the doggy stocking. It worked, but I have a few more grey hairs now.